It is late afternoon. The rain is lashing against the window panes. It is stormy outside. There are flashes of lightening followed by deafening roar of the thunderclap. The kids get scared - sometimes genuinely and sometimes feigning. It is the second day of the New Year and the festive mood is still on. No one is prepared for a routine dinner. It has to be something “different”. After several rounds of discussing different ideas that came up, everyone agreed in unison on making pizzas for dinner. Luckily we had some basic ingredients required for making Pizzas. 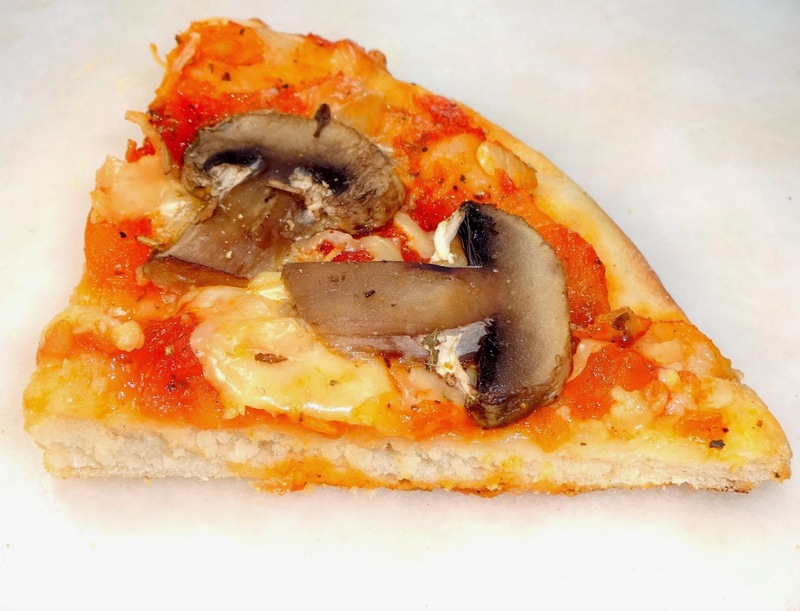 Immediately the family got together and started kneading dough, chopping onions, slicing mushrooms, zucchini, baby corns, grating cheese and preparing Pizza sauce. The dough was kept in the warmed oven while other preparations were on. We had an early dinner of hot, fresh home baked pizzas with wholegrain base. The start of the year seems really good :) ! Take 1 ½ cup warm water in a bowl. Add sugar and dissolve. Add yeast and cover. It will foam after 10 minutes ensuring that the yeast is working. Whisk the flours along with salt and oil. Add yeast mix. Knead for 5 to 6 minutes till you get a smooth dough. Add more water if the dough feels hard or dry, knead again for another 5 minutes till the dough becomes smooth and elastic. Grease a bowl with some oil. 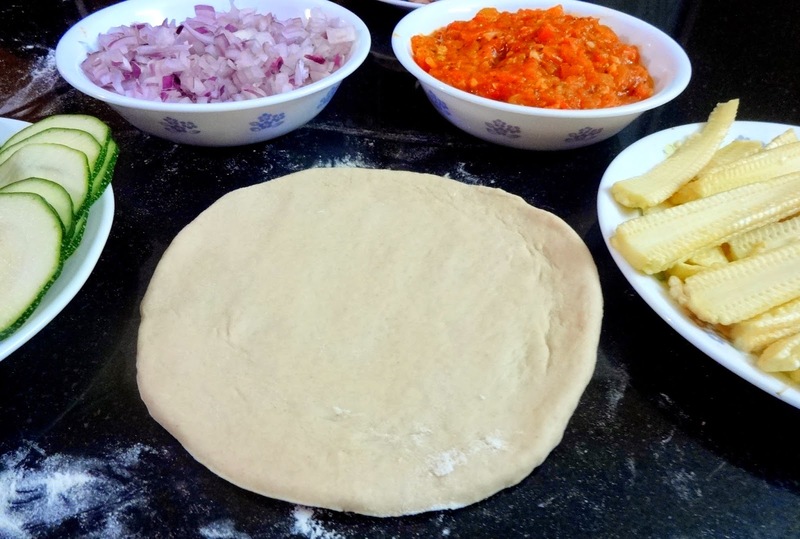 Place dough and turn it around so that it is coated with oil on all sides. Cover with a cling film and let sit in a warm place for 1 ½ hours or until it double in size. Remove the plastic film. Punch the dough down. 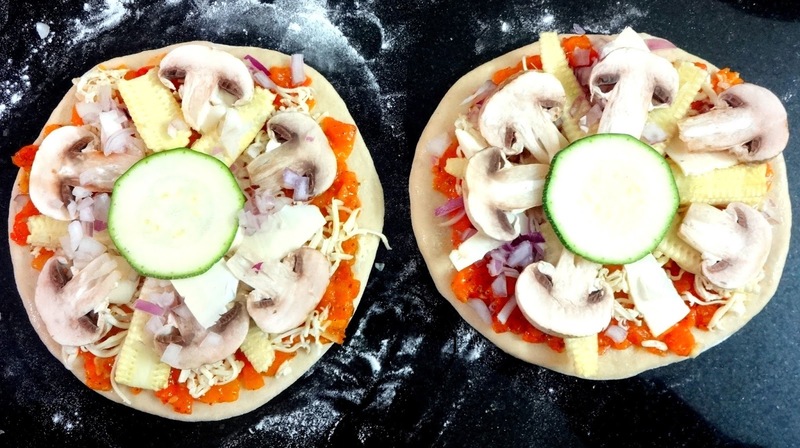 Divide the dough in half for two thick pizzas. 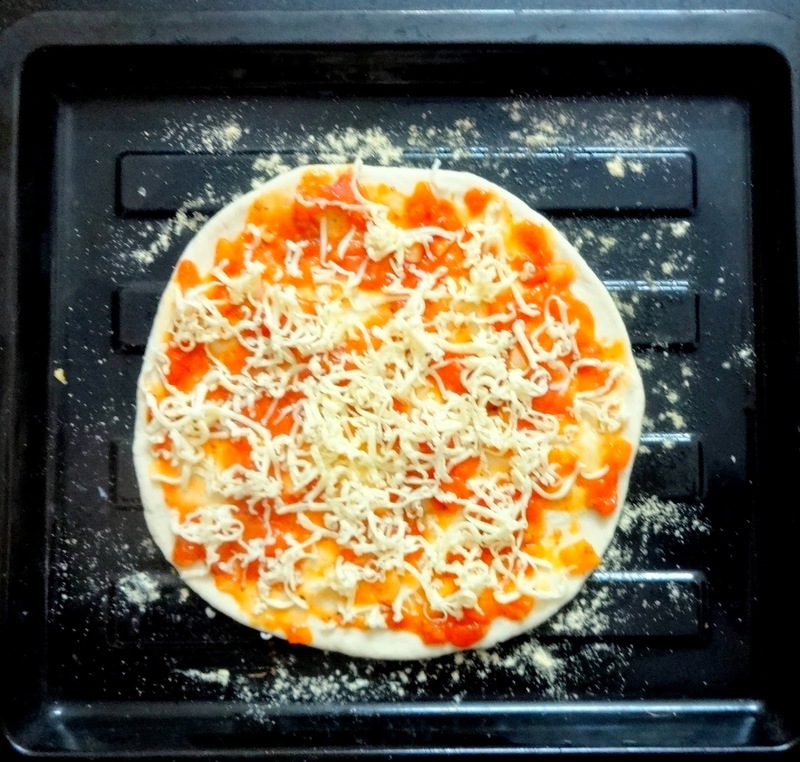 Or else, divide into four parts for thin crust pizzas. Cover the balls with a kitchen cloth and let sit for 10 minutes. Brush the top of the dough with olive oil. 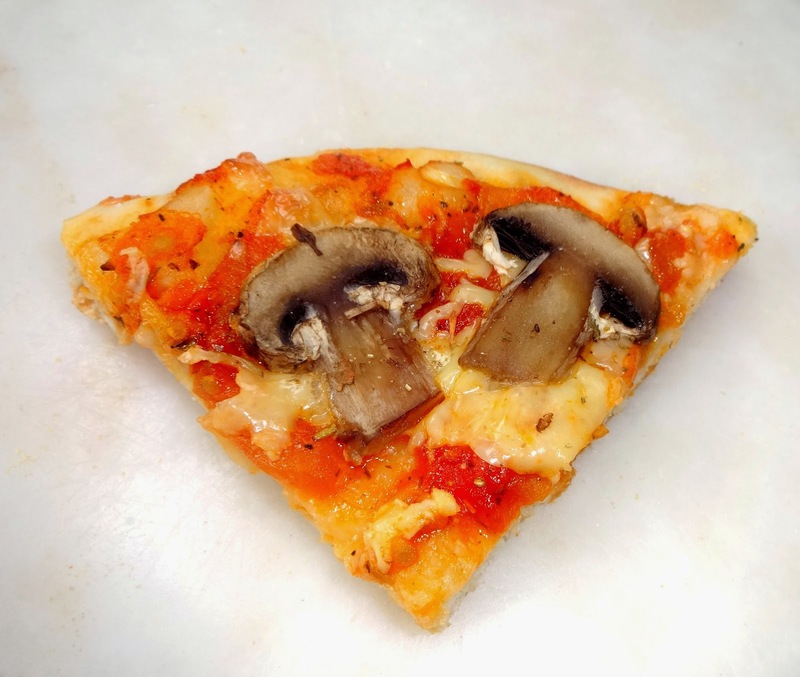 It will prevent the top from getting soggy from the toppings. Make dents with fingertips on the surface of the dough to prevent bubbling. Let rest for another 5 minutes. 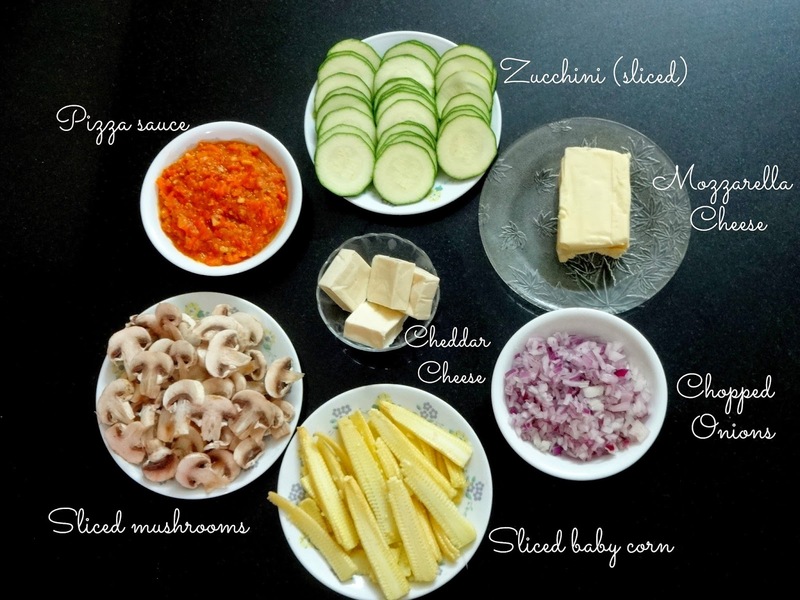 Add your desired toppings (onions and mushrooms, mushrooms and baby corns, zucchini or plain onions). 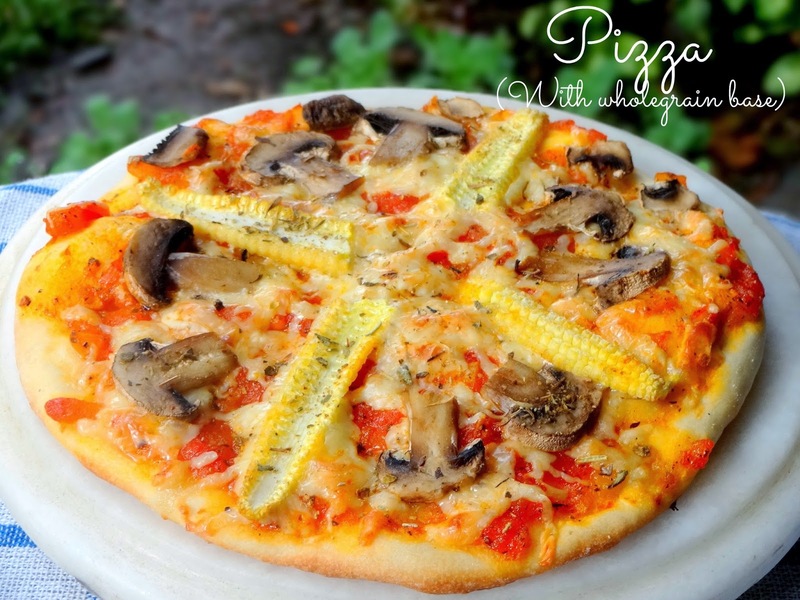 My Notes – We prepared pizzas with the basic ingredients we had in our pantry. You may add Parmesan cheese in place of Cheddar cheese. You may also use thinly sliced bell peppers and other toppings. Hello Merlin, Yes when the quantity of yeast is less, rising time increases. Please go ahead and enjoy your home made pizzas! 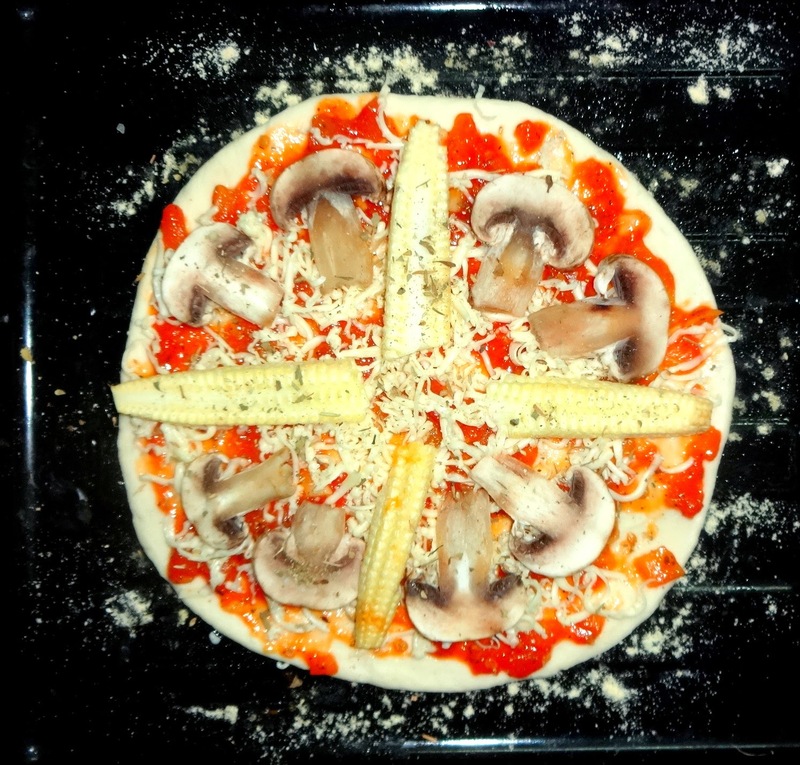 Hello, tried your pizza base with whole wheat flour,topped with veggies and sausages, we all enjoyed it! !